The pleasure of your company is requested... The adventure is set to begin. Spring's cacophony of birds and blossoms makes you warble a singular song, "Here I am, matchless me, unique, distinctive, one-of-a-kind me!" Amidst summer's profusion of butterflies and berries, you seek your own flourishing. Autumn teaches you the art of gentle yielding, as green leaves surrender to topaz, saffron, scarlet. In winter, the serpentine twists of bare tree limbs reveal that your life is a hidden magnificence of fits and starts, strides and missteps. Savor this book of seasons. It's your invitation to wonder. Your companion on that remarkable journey, that riotous celebration called life or living ... or is it just called singing after all? The mission of Veriditas Books is to publish books and spoken-word recordings that foster intimate communion with the natural world. We feel Invitation to Wonder transports readers through the cycle of seasons, allowing them to discover beauty, wisdom and joy. 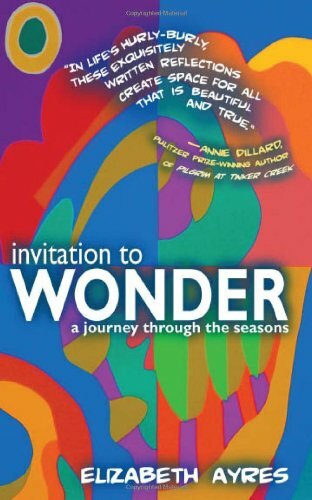 We are proud of the book, of the five titles in the Invitation to Wonder Audio Series, and of the Listening Guides which accompany each recording: "A Journey through the Seasons," "Celebrating the Journey," "A Journey into the Cosmos," "A Journey into Chesapeake Country" and "A Journey into Divine Presence." The beauty of the natural world quenches many thirsts. A glorious sunset paints the heart pink and gold. The liquid tattoo of waves on sand washes clean a worry-stained mind. A singing bird, a bright blue sky, a field of flowers can gladden or inspire or bring peace to a soul. Our lives are rushed, our times, troubled, yet Nature never fails to console. I hope, in the reading, these words bring you the same joy they brought me in the writing.